You can have a detailed view of the theme download and installation as well as the explanation of the functionalities and features of Charity theme through the video tutorial. Download and install your theme–> One click installation–> Enjoy the theme powered with awesome plugins. Downloading the Charity Theme is an easy process that just requires you to visit the link https://theemon.com/charity-wordpress-theme/ and click on buy now. After you complete the payment process you can download the theme package. After the download, unzip the package and you will find all the files and resources that you require for the installation of the theme. 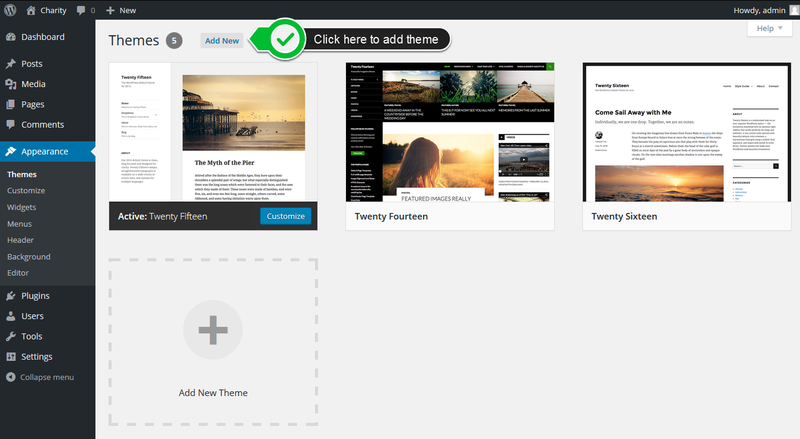 You can install the downloaded theme by going through the following path in the WordPress admin panel. After you log into your WordPress website, you need to Go to Appearances > Themes > Add New > Upload Theme. Clicking on Upload theme will let you upload the zip file of the theme package that you have downloaded. For this, you will have to click on Browse files button, choose the theme zip file and click on install now. Now, you are ready to go. Create your new site and control it thoroughly.